an UCI compliant chess engine by Daniel José Queraltó. Its development started in September 2013, and the first release was published in February 2014 . Andscacs soon evolved to a top engine, becoming runner-up at the IGWT III losing the final from Chiron with the narrowest margin of 4½ - 5½, but taking revenge one year later at the IGWT IV, this time with 6½ - 5½ to its favour. 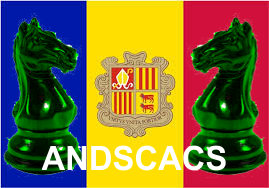 At the Tenth Annual ACCA World Computer Rapid Chess Championship 2016, Andscacs emphasized its ambitions, and became runner-up without losing a single game, but 12 wins and 3 draws, and thus the only program preventing later winner Komodo from a 100% score. Being a bitboard engine, Andscacs determines sliding piece attacks ray-wise, quite similar to the classical approach . Since version 0.70, Andscacs uses magic bitboards to speed the attack calculations . Andscacs applies a principal variation search with tranposition table inside an iterative deepening framework with aspiration windows . Beside quiescence, selectivity is due to adaptive null move pruning, late move reductions, check extensions, singular extensions, razoring and futility pruning. Move ordering is further improved by the killer heuristic, IID and static exchange evaluation, the latter also used to prune bad captures in quiescence and futile moves near the horizon. Since version 0.70, a hash move is tried in quiescence search even if it’s a quiet move. Trying only captures and promotions was clearly weaker . Version 0.80 in Apil 2015 introduced a threaded parallel search , a Lazy SMP approach . The evaluation considers material imbalances, and has piece-square tables for middlegame and endgame, piece values adapted by type of positions (open, closed), different types of piece mobility, king safety and sophisticated pawn structure evaluation with focus on passed pawns, most features smoothed out between game phases by a tapered eval. Since version 0.62u, evaluation scores are cached with a small evaluation hash table . The about 200 evaluation features were tuned with 750.000 positions to minimize the standard deviation of Stockfish's and Andscacs' static evaluation, which initially added a nice Elo boost to Andscacs , without playing too similar. This page was last edited on 17 December 2018, at 22:19.